Following SELL OUT runs on London England’s WEST-END and Edinburgh Fringe Festival, globally acclaimed comedy trio THE PRETEND MEN bring you their ★★★★★ multi award winning comedy blockbuster POLICE COPS; an 80’s cop parody featuring supercharged physical comedy, high octane action and uncompromising facial hair. Police Cops is a gut-bustingly hilarious, 70s/80s-style buddy cop drama teeming with tension, blatant foreshadowing, and lots of shirtless hugs. 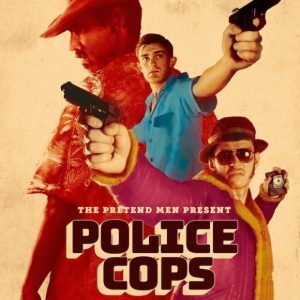 The Pretend Men are a comedy group made up of Zachary Hunt, Nathan Parkinson, and Tom Roe — all of whom hail from London, England. The three work so well together and their precision, skill with physical comedy, and time throughout the show really bring the story to life. Johnson starts by tracking down one of the best in the business, a man by the name of Harrison. They quickly become best buds and work hard to bring down a drug lord named Hernandez. But things eventually go sideways. The three men play a handful of characters. And most of their costume and set changes are already placed on stage in boxes before the show starts. The concept of changing right on the stage would intuitively be distracting, but with the hectic pace of the show and its humour, it actually works. One also gets the impression that the trio is improvising some of the scenes as they go along — and that may make each show unique. The audience was ready to go anywhere with the trio — even if that meant turning into horses and carrying babies across the desert. Yes, the show was so engaging that we willingly went along with babies riding horseback. Police Cops is a perfect mix of physical and improvisational comedy, all built upon the foundation of an extremely cohesive, believable storyline. And as with any great cop show, there will be a sequel. We can only hope to see these Police Cops again at the London Fringe. We found the show ‘Police Cops’ to be hilarious, action packed, and we loved the constant on stage costumes changes. The performers funny and quick with improv’s when things didn’t go as planned…made for many big laughs! Would highly recommend this fast past very funny show! Perfection! Brilliant in the North American definition of inspired, exceptionally clever, talented. I hope they come back to do their sequel, Police Cops in Space. Unbelievably polished writing, performing, adlibbing! I saw this show about three days ago and am still laughing about it. I could see it again. I highly recommend it. Lots of great lines, and the comedic acting is fantastic. All the actors seemed to be having a great time, and it is contagious. This is so worth seeing. My husband And I saw the show and we found it utterly boring could not wait for the show to end. Hi Johanna (and your husband). I’m genuinely curious to learn what made it boring for the two of you? I can think of a lot of possible criticisms (in theory; I liked the show a lot) but I can’t come up with any ways in which it could be described as uninteresting.